On Grandfather Mountain, breaking records is a breeze. 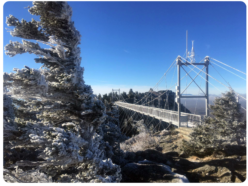 Around 4 a.m. on Feb. 13, the nonprofit nature park’s weather recording station at the Mile High Swinging Bridge registered a three-second gust of 121.3 miles per hour. This beats the mountain’s previous record of 120.7 mph, recorded Dec. 21, 2012. Sustained wind speeds reached 86.3 mph during that same 4 a.m. window on Feb. 13, and gusts continued to exceed 100 mph throughout the morning. In comparison, Mt. Mitchell recorded a gust of 77.6 mph during the same timeframe, according to data from the N.C. Climate Office. The park maintains an automated weather station at the top of the Mile High Swinging Bridge. The N.C. Climate Office assists the foundation in calibrating the machines and ensuring overall accuracy of data. Grandfather Mountain has been an active member of the National Oceanic and Atmospheric Administration’s (NOAA) Cooperative Observer Program since 1955 by reporting daily temperature, precipitation and weather events from a location near the Mile High Swinging Bridge. Park naturalists also record and report daily precipitation totals from the Nature Museum and Entrance Gate to the Community Collaborative Rain, Hail and Snow Network (CoCoRaHS). With rare exceptions, the temperature will be 10 to 20 degrees cooler at Grandfather Mountain than in the flatlands below. The average rate is 2.2 degrees per 1,000 feet, meaning that for each thousand feet gained, the air is 2.2. degrees cooler. For more information on Grandfather Mountain’s weather or to access current conditions, click here. The not-for-profit Grandfather Mountain Stewardship Foundation strives to inspire conservation of the natural world by helping guests explore, understand and value the wonders of Grandfather Mountain. For more information, call 800-468-7325.